Logistics Service Providers: Collaboration with IFFs, 3PL, or 4PL Providers? Supply chain complexity is reflected through the existence of multiple logistics service providers (LSPs). The decision on the appropriate logistics partner is considered significant for the chain efficiency. The managerial problem relies in the providers’ efforts to broaden their service portfolio, thus erasing controversies concerning the identification of their core competences. This issue mainly lies in the selection among an International Freight Forwarder (IFF), a Third Party Logistics Provider (3PL), and a Fourth Party Logistics Provider (4PL). The aim of this chapter is to provide an overview of the characteristics and services offered by the LSPs, present the benefits and drawbacks from the collaboration with each entity, and finally form a framework regarding their representative features. The framework is articulated based on literature review and aims to provide a guideline to the interested chain members, enabling them to assess their needs against the LSPs’ characteristics. 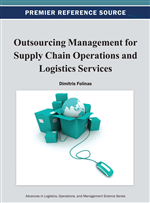 The trends of outsourcing, global sourcing, containerization and logistics providers’ integration (Matopoulos and Papadopoulou, 2010) are driving the developments within the supply chain constructs. The establishment of control mechanisms, as well information systems integration, enabling the exchange of data among logistics entities are considered to be the key success factors (Hoxha et al., 2010), in order for the logistics providers to cope with the fierce global competition. Globalization favours commercial transactions, as they reach markets that were not accessible in the past, but the logistics entities have increased, thus amplifying competition (Cherbakov et al., 2005). The drastic competition motivates the creation of dynamically adaptive patterns among the supply chain members (Ji, 2008), so that the integration of supply chain resources can be effectively arranged, resulting in the maximization of each chain member’s benefits (Yao, 2008). Depending on the customers’ needs, the logistics outsourcing industry can be segmented into the (a) insourcers, where no outsourcing activity is evident, (b) foundational outsourcers that provide the basic logistics services of transportation, warehousing and freight forwarding and can be considered as cost oriented, (c) lead logistics outsourcers that provide a wider range of supplementary services, and (d) full spectrum outsourcers, focusing on a more holistic provision of services (Rajat, 2010). In order to respond to the constantly evolving customers’ expectations, remain competitive and increase their market share, the logistics service providers (LSPs) focus on developing their skills. This attempt is realized through the broadening of their service portfolio that leads, not surprisingly, to the existence of different types of LSPs providing overlapping services. But is this practice beneficial to the shippers and/or consignees? Each type of LSP is characterized by differentiated features and core competencies, aiming to enhance specific functions along the supply chain. The technological advancements that have been developed in order to enable the coordination of logistics operations, along with the accumulated experience of supply chain consultants, constitute the most prominent factors for the existence of a supply chain integrator, whose role is to manage and coordinate both the logistics entities and the resources along the value chain. The physical and technical boundaries among the LSPs have been abolished, giving rise to the electronic information exchange, on an internet platform, thus enabling prompt information flows and streamlined coordination of multiple entities (Lu and Wang, 2008). Within this context, the chapter will focus on the role of the logistics service providers, namely the International Freight Forwarders (IFFs), Third Party Logistics Service Providers (3PLs) and Fourth Party Logistics Service Providers (4PLs), and compare their individual characteristics. In the first section, an extensive literature review is conducted regarding the evolution, categorization and entities of the logistics service providers. More specifically, the evolution and major characteristics, such as operating models, provided services, benefits and drawbacks, of the IFFs, the 3PLs and 4PLs are analyzed, providing a typology of the entities that operate in the logistics field. Literature review results in a collaborative and integrative scheme among the different entities, aiming to clarify each provider’s position in the market. In the second section, the fundamental managerial problem of partner selection among the multiple logistics entities is identified and a framework that can be exploited by the interested chain members, as a guideline for the appropriate selection is presented. In the last section, final conclusions are drawn, and also key issues for further investigation are identified.